February 2017 - Sawtooth Mountain Maple Syrup Co.Sawtooth Mountain Maple Syrup Co. Everyday is a work day in the sugarbush. We had some heavy wind come through a few days back, and there was some concern about trees (and their limbs) pinning lines to the ground. So far so good … no blown boosters from the freeze either. But there is a wonderful benefit to hiking the lines besides the exercise; Wildlife! We’re birders for sure and we enjoy all species that migrate through the bush or make it their home here in the boreal forest. So walking back down the line I happened upon this female Pileated woodpecker hunting grubs – or just hammering a tree because it feels good. … All went well at the evaporator. It happened, and we were prepared – but it was a scramble and an unexpected thing to start the boiling process on February 19, brewing up 171 gallons of lovely Grade A Dark Amber that day. Every season we start the tapping process in late January. 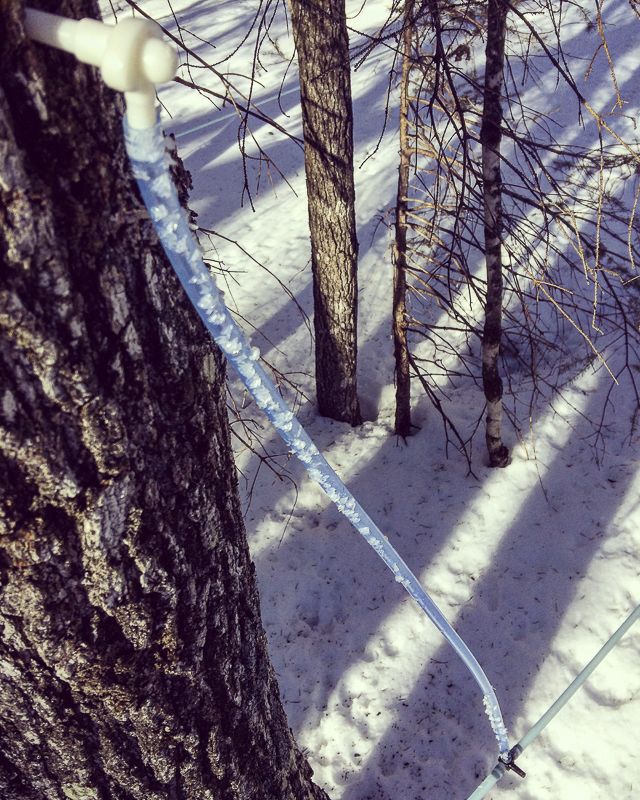 Our observations in the forest at that time (this season) – Water was flowing beneath the snow and under our snowshoes. So a sense that there may be an early warm-up rested uneasily at the back of our minds. We finished our tapping in early February and, instead of the customary idle time to put the pan together and connect up transfer lines and fix stuff, we just kept the tasks and farm chores on a steady pace. In fact my plans were to update the web pages during the cold spells; instead we made over 700 gallons of maple syrup. Over 50% of the syrup we produced was Dark Amber followed by a Medium Amber and finishing the run with a couple drums of Light Amber – all Grade A of course. Starting with a concentration of 8 brix the first day of boil and gradually increasing to 11 brix by the time we concluded the four day run. Niter was almost non-existent and very little scale was found on the front pan. But we’ll be cleaning the pan within the week regardless and in preparation for the next round. Plenty of snow resides over the roots of our trees (thankfully) with a two to three foot base, snowshoes are required to walk lines but with the hard freeze we are enjoying, one could ride a Fat-Tire bike a top the snow. Drop line squirrel damage – A busy season for Red Squirrels who enjoy pestering the sugar makers. It has been a busy year for Red Squirrels, Pine Martens, and other critters that like to chew our lines – we’ve been going through the electrical tape like we own stock in it. Scotch Super 33 is the best by far for all weather patching. But sometimes there is little other option but to replace drop lines and laterals all together. Grrrr! We’ll be on standby for the duration of the cold snap which is expected to last in to the second week of March – but that could change.